Peter Michael Quinn joined the Royal Australian Navy as a warfare officer in 1983 from Mackay, Queensland. Following initial training at the Royal Australian Naval College (HMAS Creswell), he served in a number of RAN and Royal Canadian Navy frigates and destroyers as an Officer-of-the-Watch and Air Intercept Controller. He was promoted to lieutenant in 1990 and in 1991 deployed to the Persian Gulf in HMAS Darwin. Completing Principal Warfare Officer (PWO) training in 1992, he was awarded the Sydney-Emden Prize and Saint Barbara Association Award as dux of the course and went on to serve as PWO in the frigate HMAS Newcastle and destroyer HMAS Perth. As a newly promoted lieutenant commander he served as Officer-in-Charge of the RAN Maritime Warfare Training Centre. In September 1999 he deployed to East Timor with the International Force East Timor. From early 2000 Lieutenant Commander Quinn served as the Executive Officer of the frigate HMAS Adelaide, prior to being promoted commander in mid-2001 to manage Navy’s combat system operator, diving, mine warfare and command team training as the Head of Combat System Training at HMAS Watson. Commander Quinn’s next appointment was as commanding officer of the frigate HMAS Sydney from 2003 to 2006. During his time in command HMAS Sydney became the first ship to conduct the extensive guided missile frigate upgrade. He was awarded a Conspicuous Service Cross (CSC) for his outstanding achievement as commanding officer of HMAS Sydney during that time. On promotion to captain he served in the Capability Development Group as Director Maritime Combat Development until early 2009 and commanded the frigate HMAS Anzac from June 2009 to October 2010. In 2011 he completed the Defence and Strategic Studies Course and was promoted to commodore in December that year. He served as Director General Navy Capability, Transition and Sustainment until December 2014, where he was responsible for transitioning Navy capabilities into service; most notably the new Landing Helicopter Dock amphibious ships, Guided Missile Destroyers and Seahawk “Romeo” combat helicopters. 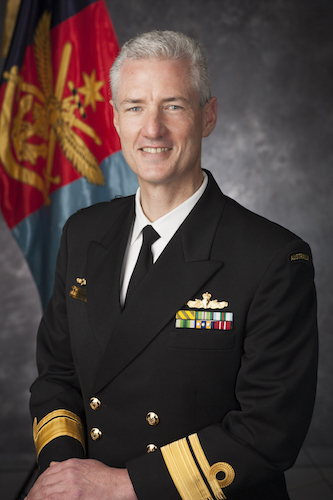 In December 2014 he was promoted to rear admiral and appointed as Head Joint Capability Coordination. On behalf of the Vice Chief of Defence Force and as an outcome of the Defence First Principles Review, he recently led the detailed design of the new capability life cycle and was appointed as Head Joint Capability Management and Integration. On 8 December 2017 he took up the appointment of Head of Navy Capability. Rear Admiral Quinn was appointed as a Member of the Order of Australia (AM) in the Queens Birthday Honours List 2018 for exceptional service to the Royal Australian Navy and Defence in senior management.